Green coloured vinyl. 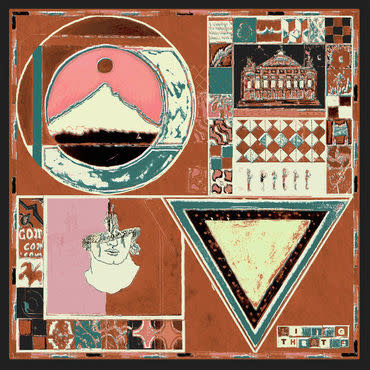 The musical duo of Shane Butler and Caity Shaffer released their debut album as Olden Yolk last year, an alluring concoction of hypnagogic folk and kosmiche rhythms, expanding and refining Butler's work in his former band Quilt toward a more focused direction. Living Theatre is the follow up to that eponymous debut and more than lives up to its promise. The songs on Living Theatre were written and recorded during a heavy time of transition and upheaval for the duo, with personal tragedies and a big move from their NYC home to a warmer climate in Los Angeles coloring the album's inception. Thematically Living Theatre tunes seem to be about how humans react to the ways life is colored by both fate and the consequences of the conscious and unconscious decisions we make. Musically, the duo's songwriting has gelled into a unified front, relying more on the subtle shifts of melody and rhythm than a barrage of chord changes; Living Theatre's hooks lap at your feet like a babbling brook, rather than bowl you over like violent waves. The refinement in tunes like Castor and Pollux, Grand Palais and first single Cotton and Cane points to a new frontier for the group; soaring skyward toward the emotionally textural plateaus of trailblazers like The Go-Betweens or Yo La Tengo. There's a discernible romantic feel to tunes like Violent Days or Distant Episode's lush arrangements with Shaffer in particular finding her own voice here; poetic, abstract and expressive. Living Theatre showcases a band breaking free from it's chrysalis, and embracing its next phase of evolution.